Ramona Roberts, a special education teacher in Jenks Public Schools, works with students Tim Foster (center), Michael Copeland (left), Elijah Sexton (bottom right) and Hunter Falconer (right). Jenks has had special education teacher vacancies in the past, but managed to fill its positions this year. That’s why late one night in August, Ponca City Public Schools Superintendent Shelley Arrott sprang into action when she heard the distinctive ding of her cell phone. The alert meant a job application had been submitted online to the district. She scrambled to arrange an interview the next morning for the applicant. The district hired Melissa Parks, who is certified in special education, on the spot. And she has since received at least seven other job offers. Now, Arrott said, the focus is on keeping Parks and others like her. Special education teacher Melissa Parks was hired to fill a vacancy in Ponca City Public Schools the day before classes began. The district scrambled to hire her, knowing her qualifications. To fill teaching vacancies, Oklahoma schools are increasingly relying on emergency certified teachers, and as of August a record 1,400 had been approved. But by law, special education slots aren’t eligible. For some school districts, a solution is larger class sizes. That means more students in regular classrooms, where special education students learn alongside other students, and larger self-contained classrooms, where students with disabilities receive specialized interventions and support. Districts say hiring paraprofessionals helps special education teachers manage more students. Paraprofessionals provide instructional support, such as tutoring and classroom management; paraprofessional jobs don’t require a degree and pay around $8 an hour. University of Oklahoma Professor Gary Davis signs to his American Sign Language I class, which is part of the College of Education’s special education program. Students sign along with their professor in an American Sign Language I class at the University of Oklahoma. The class is conducted in sign language, and it is the first time ASL is being offered at OU. Professor Gary Davis signs to his students during a lecture in his American Sign Language I class. The class is offered through the University of Oklahoma's Department of Educational Psychology. Special education teachers work with students with disabilities, which include autism, emotional disturbances, traumatic brain injuries, learning disabilities, and hearing and visual impairments. Sixteen percent of Oklahoma students, or more than 109,000, needed special education services in 2016-2017, an increase of 10,000 students over 2011-2012, according to the state Education Department. Federal law requires each student with disabilities to be on an individualized education program, which has improved services for students but is contributing to teacher burnout, says Eleanor Goetzinger, a behavior specialist and special education teacher at Oklahoma City Public Schools. Parents are an integral part of the program and meet with teachers regularly for updates on their child’s progress. Goetzinger said she always feels like a juggler with three balls in the air: teaching, a vast amount of paperwork, and a lot of meetings. “You’re trying to figure out whether to do the paperwork or teach the kids,” she said. She has also seen an increase in the number of students with mental illness who are at times dangerous to themselves or others – an issue she wrote about in 2016. Goetzinger herself was assaulted by a third-grader in 2013. And while taking the boy to the principal’s office, she was pushed into a wall by the boy’s father. She suffered a concussion, but returned to the classroom. Even traditionally trained, special education teachers are often unprepared for these students. Most of the time, special education students are educated within a regular classroom, with the special education teacher providing support. Having a well-trained special education teacher on staff is an invaluable asset to the school, said Roxie Terry, superintendent of Waurika Public Schools. The district of 400 students has struggled to fill teaching vacancies, in part because the community is just a few miles north of Texas, whose teacher salaries are significantly higher. “A special ed teacher is a fantastic tool for the teachers. It’s not just the students that improve. Your entire faculty and student body gets better,” Terry said. A special education teacher can recommend specific teaching methods to colleagues that help certain students and improve overall teaching. Waurika’s high school was without a special education teacher for several years until the current teacher was hired in 2014. Terry said students now receive more supplemental instruction and individualized attention. Some small, rural districts don’t employ a special education teacher, data show. If they have students with disabilities, those districts can either share services with another district or provide them through a special education co-op. 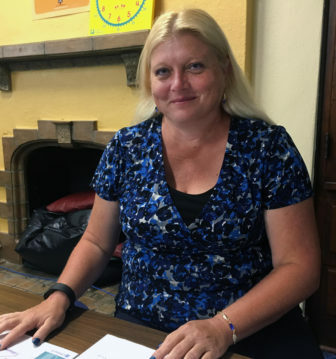 Fewer people and resources raise the risk that students won’t receive the best quality education, said Katherine Bishop, vice president of the Oklahoma Education Association, who taught special education for 22 years. “Anytime you cut back … that’s less support you’re able to give,” she said. Lilly Fragoso, a paraprofessional in Jenks Public Schools, assists special-education student Jacob Miller. Paraprofessional provide instructional support for special education teachers and don't require a degree. Angie Hopkins, a paraprofessional with Jenks Public Schools, works with special education student Ryan Chen. Jenks Public Schools, just south of Tulsa, typically maintains a strong applicant pool but has for years struggled with vacancies in special education. This year, all positions were filled due to the district’s beefed-up recruitment efforts and encouragement of other teachers to pursue certification in special education, said district spokesman Rob Loeber. The state Education Department offers a “boot camp” to fast-track educators willing to pursue a master’s degree or certification in special education. This alternative route, available to any district, was approved by the state Legislature in 2013. Participants receive 120 hours of training in special education online over six Saturdays and perform 30 hours of field experience, after which they can apply for a provisional certificate. They can start working with a provisional certificate, and it can be renewed twice as long as they complete six hours of college coursework per year. By the end of the third year, the candidate must meet the criteria for a standard certificate. In 2016-2017, the Education Department began providing grant money to reimburse districts the cost of special education training and certification, one of several initiatives recommended by a teacher shortage task force. At the University of Oklahoma, initiatives include a debt-free teachers program, which forgives student loans for teachers who go into high-need areas. Arrott, the Ponca City superintendent, said the lack of external applicants spurred her to recruit from within – by approaching classroom teachers and encouraging them to obtain certification in special education. So far, three have been certified. The district also hired a retired teacher with special education certification to return to the classroom part-time. More traditional recruiting efforts, such as attending out-of-state job fairs, have proven to be a waste of time, she said. “Out-of-state candidates aren’t interested because of the pay,” she said. Moore Public Schools started this school year with at least eight unfilled special education positions. The district is relying on paraprofessionals and teaching assistants in many schools, and Superintendent Robert Romines says it’s not ideal.